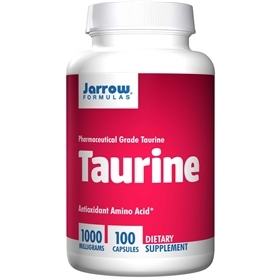 Taurine is a sulfur-containing, antioxidant amino acid that protects against free radical damage to cells. It aids in osmoregulation (maintenance of proper concentrations of ions) inside the cell, membrane stabilization, sperm motility, bile acid conjugation, neurotransmission and athletic performance. It acts as an insulin mimetic, to allow for better glucose deposition into muscles. Take 1 capsule per day or as directed by your qualified health care consultant.